For rights activists, Trump’s victory is a dark cloud with one silver lining. For the next four years, human rights groups will be inoculated against accusations of complicity in US foreign-policy machinations. Once Trump assumes control, no good-faith critic is likely to condemn Human Rights Watch, Amnesty International or their local counterparts as “agents of the American empire.” After all, the new US president explicitly rejects fundamental rights principles. He advocates torture of terrorism suspects, killing of their family members, creating a national registry of Muslims, expanding libel laws to silence the media and taking away citizenship from US-born children of immigrants. One variant of this critique argues that international rights groups and the US government, in the early 1990s, came to a devil’s bargain. 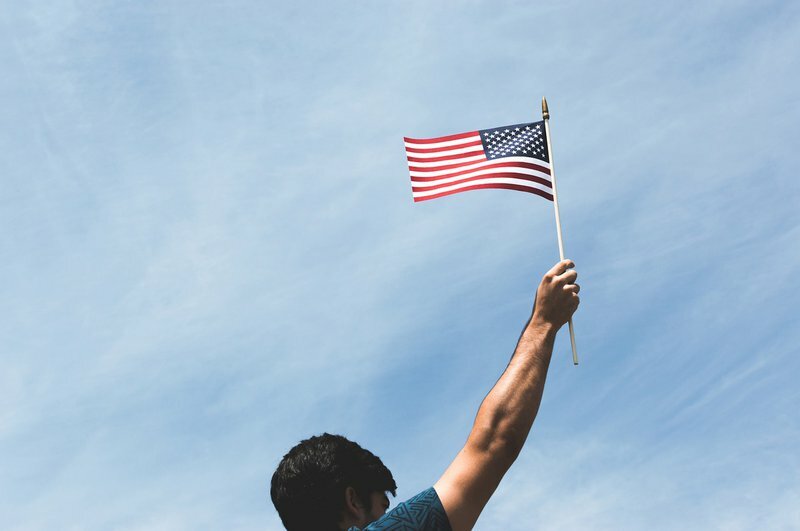 International rights groups endorsed US global primacy, and in exchange, Washington offered support for international rights norms and institutions. A third school argues that while rights groups claim their ideas are universal, the principles they espouse promote a uniquely Western view that establishes US political ideas as the global norm. Consider this. In spring 2014, a group of 125 Nobel Peace laureates, activists and scholars slammed the New York-based Human Rights Watch for maintaining a “revolving door” with the US government. Exhibit A, they said, was Tom Malinowski, a senior staffer who joined the US-based rights group in 2001 after working in government and who then returned to federal service in 2013, as director of the State Department’s Bureau of Democracy, Human Rights and Labor. According to the Nobel laureates, this and similar cases suggested HRW was overly close to US policy elites. Given “the impact of global perceptions on HRW’s ability to carry out its work,” they wrote, even “the appearance of [this kind of] impropriety” undermines the organization’s credibility. HRW leaders disputed these claims but acknowledged that “the stigma of ‘western imposition’” often impedes their efforts. And in Ecuador, Egypt, India, Pakistan, Russia, Venezuela and many other countries, authorities increasingly charge both local and international rights groups with doing Washington’s bidding. These officials have also cracked down on Western funding to local rights groups, arguing that these moneys violate their national sovereignty. 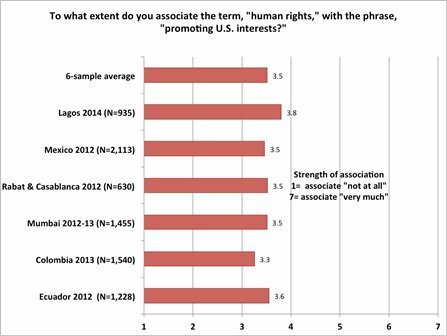 Survey results from around the world show that adults do not associate “human rights” with “promoting US interests." Our own survey research, though, suggests that relatively few people buy these arguments. We conducted face-to-face surveys with randomly selected samples in six countries from 2012 to 2014. These include national coverage in Colombia, Ecuador and Mexico and coverage of key urban and rural areas in India (Mumbai and its rural environs), Morocco (Rabat, Casablanca and environs) and Nigeria (Lagos and environs). We found little evidence that ordinary adults suspect human rights principles or organizations of serving as US agents. (In these questions, we did not ask for reactions to specific human rights issues, such as the rights of the LGBT community; on these, different groups of people may think differently). Our first survey question was “To what extent do you associate the term ‘human rights’ with ‘promoting US interests?’” We asked more than 9,000 randomly selected people to respond on a scale of 1 (no association) through 7 (maximum association). Most did not associate “human rights” with “promoting US interests,” as the average strength of that association, across all six cases, was 3.5, below the midpoint of 4 on our 1-7 scale. We also asked people how much they trusted human rights organizations and the US government, using a four-point scale that we later re-scaled from 0 (no trust) to 1 (maximum trust). We found that people trust human rights groups more than the US government. Average trust in local rights organizations was 0.54 on the 0-1 scale and 0.52 for international groups; average trust in the US government was only 0.46. (Lagos residents were far more trusting of the US government than the others, perhaps because of Nigerian domestic politics, where views toward the United States do not figure prominently.). Our statistical analysis, moreover, discovered no positive relationship between trust in the US government and trust in human rights organizations. Finding such a relationship would be necessary (if insufficient) for us to conclude that respondents suspect that rights groups work with, or for, the US government. Our data show that people believe either that human rights groups are geopolitically neutral from the United States or that they tilt against Washington. We found no evidence that many people suspect rights groups of serving as secular missionaries for a Western point of view that paves the way for US political hegemony. Accusations that human rights groups are “handmaidens of a US empire” come either from academics or from political leaders, especially autocrats, seeking to deflect attention from their own misdeeds. In the months to come, Trump’s administration will probably do much to expand this gap between the US government and rights groups. The more that Trump and his advisers endorse anti-human-rights policies, the more likely rights groups will be seen as distinct from Washington. Academic skepticism and political critiques of human rights NGOs may become increasingly difficult to maintain. For the next four years, the dividing line between “US government” and “human rights organization” is likely to be very clear. First appeared on November 29, 2016 in The Monkey Cage at The Washington Post.